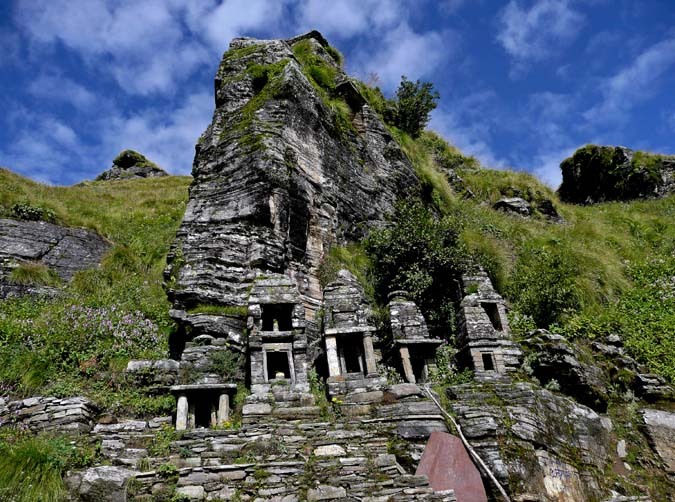 The Panch Kedars are traditionally visited in an arc starting from Kedarnath, Tungnath, Madhyamaheshwar, Rudranath and Kalpeshwar than a visit the temple of Badrinath is made. 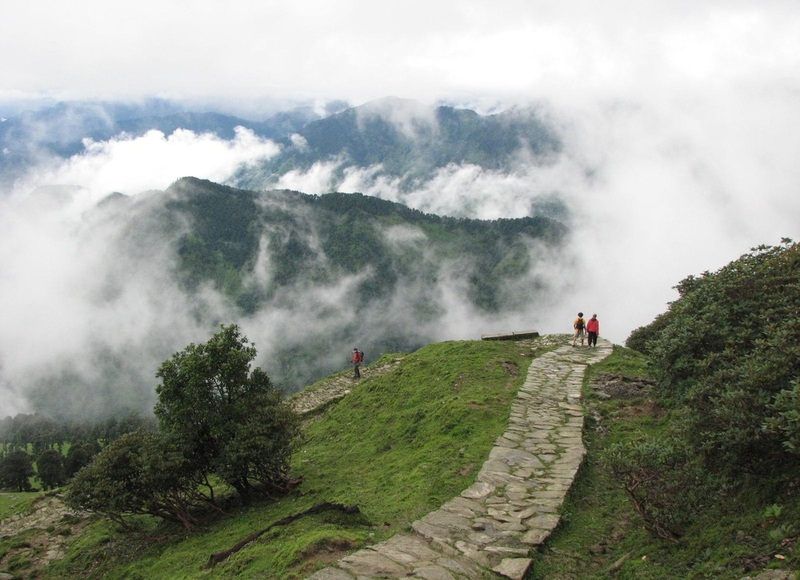 The Rudranath and Kalpeshwar trail is demanding with long tiring climbs from dense forests. However the path is well defined. Enroute one comes across charming villages and 360° panoramic views of the Himalayas. There are beautiful views of Alaknanda carving its way down the plains, the dense dark green valleys between Gopeshwar and Mandal as well as mesmerizing views of Nandadevi and it's sentinels. The starts are visible with dazzling clarity. The trail is filled with colors of mother nature and offers splendid views through thick forests, green valleys, lush green meadows, beautiful flower beds and high ridges. The views are mesmerizing as the trekker is rewarded with bird's eye view of the lush green meadows and valleys and snow capped Himalayan Peaks. There are deep gorges full of wild colorful flowers and orchards. Rudranath (3600 meters) is said to be the place where Lord Shiva's face appeared when he went underground to hide from Pandavas in his bull form, when they came asking for his forgiveness for their sins, however Shiva did not wanted to forgive them. 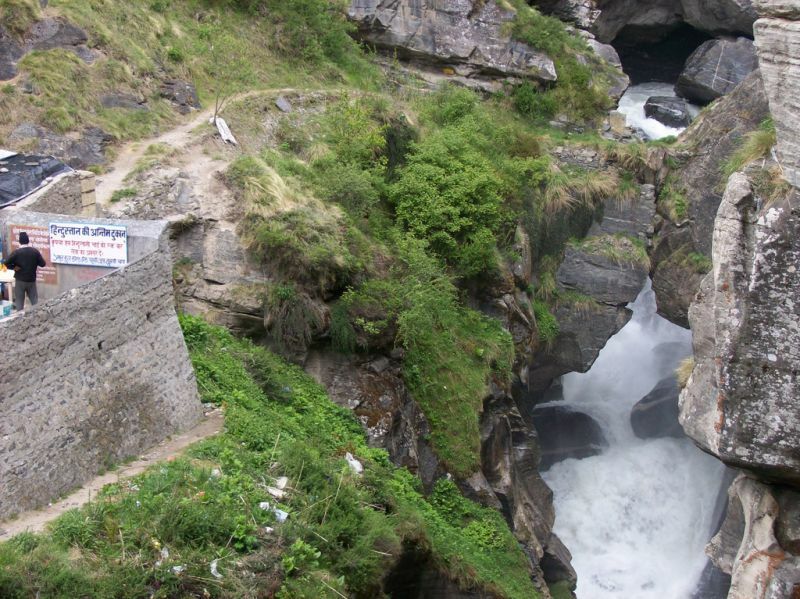 The holy river Rudraganga flows near the temple, with a grey stone idol of Rudranath. This river is said to absolve all Sins of the dead ones when their ashes are submerged here. Thus devotees visit Rudranath to perform rituals. The temple of Rudranath is bounded by Surya Kund, Chandra Kund, Tara Kund, Manas Kund. The magnificent peaks of Nanda Devi, Trishul and Nanda Ghunti are visible from here. Kalpeshwar (2200 meters) houses the famous Kalpavriksha, which is said to fulfill all wishes of a person. The temple is surrounded by dense woods and terraced fields. For more information about Hardiwar and Rishikesh please visit our Dodital Trek section. It takes around 8-9 hours from Rishikesh to Helang. 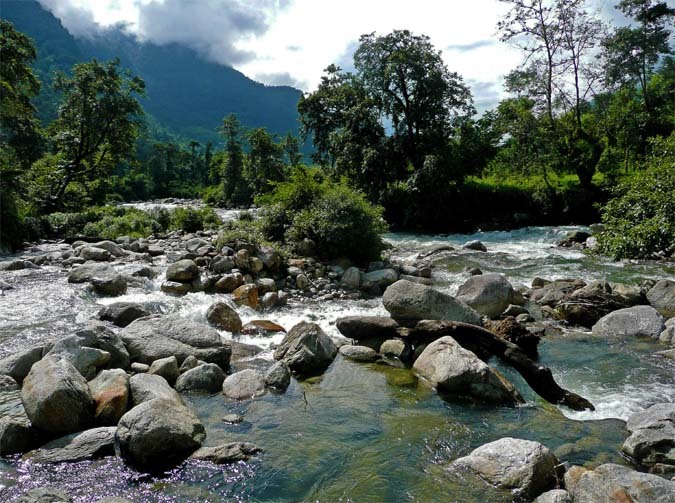 There are beautiful views of confluence of Alaknanda and Kalpganga rivers. From there it is a 12 kilometer jeep ride to Devgaon (2500 meters) followed by a little walk. We stay at a guest house tonight while enjoying the views of open fields and river and sumptuous home cooked meals. Today it's a short climb to Kalpeshwar. The trail is on a cemented track through village settlements and fields as it passes through green valleys. We will also come across a huge waterfall visible from a distance. As we come across green meadows, we can see the Kalpganga river on our right. It's an easy stroll of 45 minutes upto the valley across the river on a suspension bridge and reach the stairs of Kalpeshwar Temple. There are varieties of birds and flowers welcoming us which will be a photographer's delight. After climbing some stairs we will arrive at Kalpeshwar Temple. A cave passage in this stone temple will take us to main site, where matted tress of Lord Shiva is worshipped. After paying obeisance to the temple an deity we will proceed back to Devgaon. Today we will start early as the climb to the Bansinarayan temple is difficult. It takes around 8-10 hours to reach the temple. We will have an early breakfast and pack our lunches and take the trail towards our left, which is opposite to the trail of Kalpeshwar. We will pass terrace fields and enjoy beautiful views of Urgam Valley full of apple orchards and fields of Kidney beans and potatoes. As we pass through a field we will come across a gradual climb over a few settlements. As we reach Bansai Village there is a beautiful Urvasha Temple on the way next to a water stream. We will take a break here and pay our homage to the deity. From here as we move ahead we will come across a bridge which we will need to cross. From here the trail will climb up a ridge. We walk alongside a river stream and come across a stone temple. The trail then enters thick woods and move in a zig zag fashion. The forest gets dense and the climb more steep in ascent, occasionally over boulders. There are lush green meadows and wild flowers on our trail now. We will climb across thick boulders and have to locate the cave among the boulders spread across the meadows. Their are mesmerizing views of snow capped Himalayan Peaks of Nanda Devi, Trishul and Nanda Ghumti. Bansinarayan Cave is a beautiful campsite with beautiful views of wild flowers spread over vast meadows and snow capped peaks. We camp here tonight. We start early today to enjoy the views of picturesque peaks during sun rise. The views of sun rise on the snow capped peaks is an unforgettable experience. Bansinarayan Cave is a beautiful campsite with beautiful views of wild flowers spread over vast meadows and snow capped peaks. Today will be an easy downhill walk to Dumak Village. It takes around 20 minutes to reach Bansi Narayan temple from here. It's a small temple built out o huge stones in front of slanting boulders. The temple is surrounded by huge boulders. Bansi literally means flute and Narayan is the other name of Lord Vishnu. We will move towards the ridge to our right and enter dense forests, wild thickets and flowers. The trail passes through chestnut trees , boulders and bushes of ferns and fungi. After an hour downhill walk from here we will see beautiful views as the Alaknanda Valley opens up in front of us. We can see Kalgaot village and Dumak Village at a distance from here. After lunch we will walk over the cemented trail to reach Kalgoat which offers beautiful views of houses arranged on terrace fields. After a small break at Kalgoat Village we will proceed for Dumak which is 2-3 hours walk from here as we climb over huge boulders and shrubs. In some time we will reach an old temple made of stone right next to a bridge over a stream. You may also get a chance to view the Monal bird along the way. After another one hour hike we will see Dumak village and its terrace fields and stone walls marking the boundary. After crossing a primary school and walking down further we will reach Dumak. It's a large village arrayed along a flat road stone. We check in to a guest house and enjoy our rest along with a delicious dinner and a wonderful sleep in the pleasant weather after a long tiring day. Today will be a long and tiring day so we start early after having a filling breakfast. As we continue our trek on a cemented well paved trail, we pass through terrace fields and climb till the end of a ridge. From here take the trail on our right and walk along the right side of the valley. The trail falls down steeply from here and does another zig zag as it get narrowed. We will continue on our trail and descend down near the banks of the Rudra Ganga River which offers a beautiful view. After a break we will continue on our right while walking alongside the river as the trail become gentle. As we enter the forest, the trail become steep again. Be careful of the leeches especially if you have come in August and September. As we climb over thick boulders and thickets we will gradually reach the top of a ridge and then a little walk from there will lead us to a beautiful grassy camping site towards the end of the ridge. There are beautiful scenes around the grassland and a beautiful lake, surrounded by dense forest which is so clear that it appears like a mirror. There are also some temporary settlements of shepherds. We will stop over here for lunch. Two-Three hours climb from here over a ridge above the tree line the walk levels down on a small meadow. From here we will start our climb over the ridge and trail become steep again. As we ascent the vegetation becomes thinner until we reach the top of a ridge and then turns right towards meadows of Panar (3800 meters). There are some guest houses and eateries as well as a cave shelter for pilgrims. Enjoy breath-taking views of snow capped mountain ranges of Nanda Devi, Trishul, Ghunti and Banderpoonch. In post monsoon season the meadows are filled with a carpet of pinkish red flowers. There is a water stream flowing nearby. We camp here tonight and enjoy the beautiful dazzling views of the Stars with campfire and delicious meals. Today will be an easy mostly downhill walk through the forests. After breakfast we will take the stony trail on our left. The trail falls downs a ridge and pass through thickets in a criss-cross. We will come across meadows of Lunti, also called Lunti Bugyal. A little hike from here and the trail will enter a forest on a well defined trail. Another hour walk from here and we will cross a bridge over a water stream from where the trail will descends into the forests again. The trail is filled with colorful wild flowers. There is another meadow we will come across after another hour's walk surrounded by trees. We can have some refreshments here at nearby eateries and stalls along with a temporary shade setup by villagers. We will take a small break here. There are some flag markings here. We can see our destination at a distance from here now as we proceed on the trail leading us back to the forests until we reach the terrace fields and a trail passing through them. After crossing a small stream the trail becomes rock steps and then eventually leads to the village. Few more stone steps and we will hit the road before passing through some shops and huts. We will make a small visit and offer prayers to Sakleshwar Mahadev temple here and board our jeeps which will take you back to Haridwar, after the long and blissful journey.